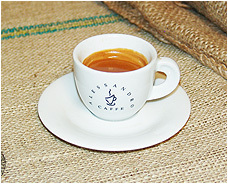 THE BLEND: Only using the finest Arabica beans will provide a balanced between bitterness and acidity as well as fragrant aroma and full body. THE GRINDER: Adjust your grinder until you find the perfect setting which should allow an extraction time of between 20-30 seconds for home brewing. The exact dose of coffee 6 to 7 grams per cup. THE MACHINE: The machine you use needs to have the right temperature as well as the correct water pressure. A water softener must be installed on the waterline to prevent calcium build up in machine. Your machine should be cleaned twice a week or more with special products to ensure the steady flow of water into your espresso cup. THE OPERATOR: The right training provided by Alessandro Caffe will produce a delightful cup of Espresso for your customers' enjoyment.